The Lakeland Terrier is the type canine with a positive attitude that allows them to adapt to virtually any situation. Natural outdoor type of dogs, they enjoy hunting and running. The are very active and will depend on their owners and family members to provide that energetic outlet for them on a regular basis. The Lakeland Terrier is quiet with strangers and they may be assertive when engaging with other dogs and smaller critters. They are rather resourceful animals and can have a comical personality for a canine. Somewhat stubborn and set in their ways, it is best to begin their training as pups when they will be more inclined to follow instruction. The Lakeland Terrier has one main requirement that is very common for all Terrier dogs and that is by being very active. They are the type of dog that is not suitable for an elderly couple or someone that does not get very much activity on a daily basis. They are an ideal companion for a runner or someone that enjoys walking or playing outdoors daily. They do very well growing up in an active home with access to get outside to run and play in a fenced in yard whenever possible. They can require some grooming for their wire fur coats which will depend on the Lakeland Terrier you own, but generally speaking they will need groomed on a weekly basis. One main characteristic that almost ever Terrier shares is that they are easy animals to care for. The Lakeland Terrier is not different in that they do not bode any noted major health issues. They can develop lens luxation, distichiasis and the vet may recommend some screening for their eyesight s they progress in age. In rare occasion they have been known to experience some Legg-Perthes disease and vWD. The average lifespan of this breed is from twelve to sixteen years, which is long for a canine. They generally weigh around seventeen pounds as full grown dogs. 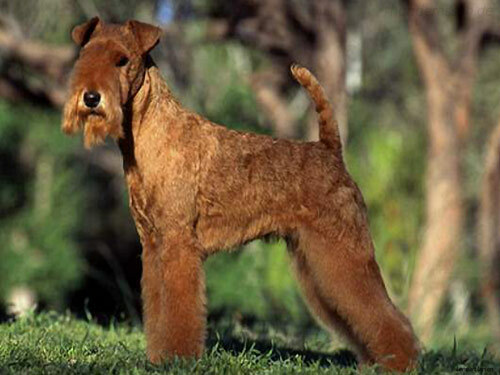 The Lakeland Terrier derived from England sometime in the 1700's. They were known for hunting small vermin and a popular favorite for farmers to own as they possessed the ability to hunt foxes that were roaming around the farming grounds. They have been noted by experts to have been created as a result of cross breeding by any of these other dogs such as the Border Terrier, Fox Terrier and the Bedlington Terrier, but which dogs were involved in the cross breeding are unsure. They received their recognition by the AKC in 1921 as being separate Terriers from their siblings as Lakeland ones. Their registration was soon to follow occurring in 1934. They do rather well in the dog show circuit and have the ideal attitude needed to win the show. While they still have yet to become a top contender in the highly desired family pet category, they do have many farmers desiring them as farm dogs and to hunt small critters that are grazing on their property.